Yuanyuan (Kay) HE began learning piano at age 5. 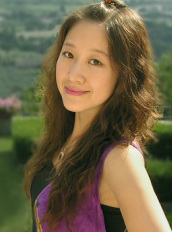 At age 15, she began studying composition at the affiliated middle school of Shenyang Conservatory of China. As a double major undergraduate, Kay He studied with Tang Jianping in composition at the Central Conservatory of Music in Beijing (CCOM), and with Zhang Xiaofu at the Conservatory’s Center for Electroacoustic Music of China (CEMC). The winner of a Snow Scholarship, Kay He completed her Master’s degree in composition at the University of Missouri-Kansas City (UMKC). While at UMKC, she studied under Dr. Zhou Long, Dr. Chen Yi, Dr. Paul Rudy and Dr. James Mobberley. Besides music, she also learned to paint at the UMKC Department of Art and Fine Arts. She is currently pursuing her doctoral degree in composition (DMA) at the University of Texas at Austin, studying under Dr. Dan Welcher, Dr. Russell Pinkston, Dr. Donald Grantham, and Dr. Yevgeniy Sharlat. As a young composer, Kay has won many composition awards in the U.S. and abroad. Her piece Passeig de Grácia for orchestra was selected for the 2015 ACO Underwood New Music Readings in New York City. On the Threshold of a Drizzly Reality for cello and electronics was selected for 2014 performances at the International Computer Music Conference (ICMC) in Athens, Greece and the Root Signals music festival in Jacksonville, Florida; her piano trio Shadow of Dewdrops was selected as a finalists for TICF2015 composition competition in Bangkok, Thailand and Gamma UT music festival in 2014; the orchestra piece Legends of Old Peking won the Seattle Symphony’s Celebrate Asia Composition in 2012; Dying Away won the 2011 DuoSolo Emerging Composer Competition; Destiny of the Sputnik was chosen in the 2011 Beijing Modern Music Festival Young Composers Project, and many other pieces have won awards or competitions in other parts of the world. To stir the tiniest feather! 連羽毛都吹不動! Against three tongues together? 三張嘴巴齊説? Her edict "to begin it"-- "現在道給我說!" "There will be nonsense in it!" -- "故事裡怪話要多"
"The rest next time—" "It is next time!" "下回再講" "下回到了"